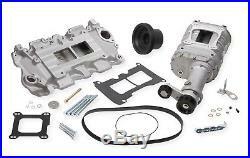 Pro-Street Supercharger Kit; 142 Blower; Long Nose; 6-Rib Drive Belt; Does Not Fit If Originally Equipped w/Four V-Belts; Standard Heads; Satin Finish. Engine Make/Size: Chevy Small Block V8. Lower Pulley: 6.00 in. WARNING CA Proposition 65: Yes. Develop 400 To 450 Plus Horsepower. Low Profile Design For Good Conscious Rodders. Increases Torque For Heavy Cars And Towing Apps. Great Power Adder For Low Compression Crate Motors. Various Snout Lengths For Different V-Belt Arngm. Full Time Power Every Time You Hit The Gas. Weiand Pro Street Supercharger kits are engineered to give you a 25% to 40% gain in power - while maintaining outstanding streetability. All Weiand blowers feature 100% new parts (no remanufactured components), including new thick-wall cases and rotors to eliminate high-RPM flex. The first Weiand product, the "High Weiand" manifold was manufactured and marketed in 1937. It was the first aluminum intake on the market. In 1949 Weiand introduced a series of "tri-power" and four 2-barrel manifolds and immediately after WWII Weiand debuted a line of aluminum cylinder heads for flathead Ford engines. The famous "Drag Star" line of "log" manifolds for Hemi engines was introduced in 1952 and in 1957 Weiand developed complete blower drives for the GMC 6-71 supercharger. Other feats first dual plane, "Colt" 180 degree intake 1965, and in 1968 came the "Hi-Ram Manifold" with its patented D-port technology. Next "X-terminator" single plane manifold series in 1972 and Weiands high performance aluminum water pumps the following year. "X-CELerator", a series of performance single plane intakes was developed in 1974. "Team G" series of 360 racing manifolds were introduced in 1978. A year later "Action" series of high performance replacement manifolds debuted. Weiand became the first OE supplier of superchargers to Mercury Performance Marine in 1990, and over the next three years the "Stealth" series of high performance dual plane manifolds was designed, the "Pro-Street" supercharger was certified "emissions legal" by CARB and Weiand received the industry's first E. Then the 8-71 supercharger for SBC and BBC in 1996 and the first aluminum LS-1 intake manifold in 2002. To make more power you have to get more air into your engine. Look to Weiand as your power source, or partner with products from other Holley companies, to give you even more power! Please check the compatibility tab to confirm if this part will fit your vehicle. Processing begins as soon as an order has been placed, therefore we cannot change, cancel or modify orders once they have been confirmed. Most e-mails are answered within 24 hours, including weekends and holidays. The item "Weiand 6500-1 Pro-Street Supercharger Kit" is in sale since Saturday, May 13, 2017. This item is in the category "eBay Motors\Parts & Accessories\Car & Truck Parts\Turbos, Nitrous, Superchargers\Superchargers & Parts". The seller is "sparktecmotors" and is located in United States. This item can be shipped to United States.